Feeling all parched while you’re out and about in Paris? What to do? What to do? Follow my lead. I’ve got you covered! Fortunately, there are 108 historic “fontaines Wallace“ and three functional “puits artésien” (artesian wells). 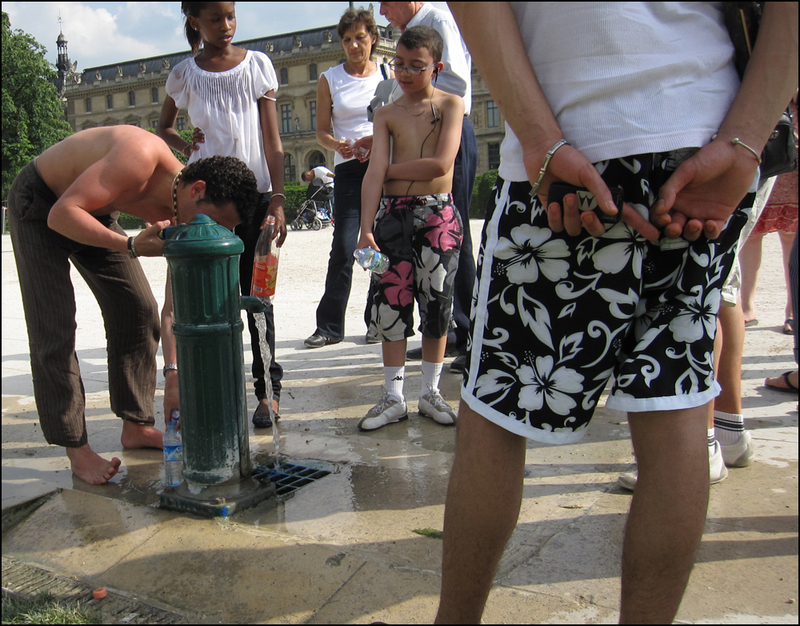 Situated around the city’s busiest squares and at intersections in each arrondissement, the drinking water is free for sipping. So grab an empty bottle! Rewind! “Les fontaines Wallace” were named after the British philanthropist and art collector Sir Richard Wallace, who generously financed the installation of 50 fountains throughout Paris after the Franco-Prussian War left the city with almost no clean drinking water. 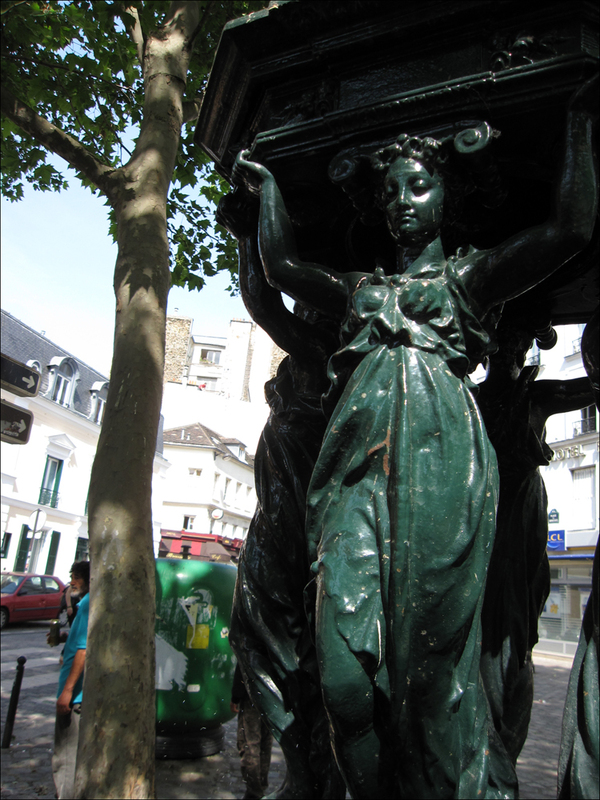 Designed by Charles-Auguste Lebourg, these cast iron fountains in four versions remain iconic darlings of the Paris streetscape. Uniformly painted a deep emerald green, they’re easy to spot. The largest model, nicknamed the “Brasserie des quatre femmes” (brewery of the four women), flaunts four fetching caryatids, symbolizing kindness, simplicity, charity, and sobriety. Curvacious stunners, the figures are draped in sinuous tunics that are pinned just-so to reveal a handsome knee. Oh, la la! Tip! After topping off your bottle, check out the surrounding hilly, cobblestoned neighborhood. Once an infamous red light district (quail was slang for prostitute), Butte-aux-Cailles now offers an impressive number of cheap eats, bars, and shops. Hello, time travel. Finally, here’s a cinematic tidbit: In the 2001 film “The fabuleux destin d’Amélie Poulain,” Amélie’s concierge in Abbesses was named “Madeleine Wallace” because she cried like a Wallace fountain! Clipping from Francophile Ben Franklin, “When the well is dry, we know the worth of water, my friend.” Bottoms up! Can’t resist…gotta say it — Theadora, you are a fountain of information. Gotta say it…………almost missed the scarf on the statue at Jardin des Tuileries due to the hottie in the shorts without the shirt! Thank goodness the heart was recently repaired!! Thanks for taking a look. I will have another whale posting soon. Saw 5 Gray Whales today 🙂 Will have to keep a note on some of these Paris destinations, hope to return there this year for the first time since 1994! Smart Rabbit. Trix are for (the cool) kids!! T.
They are so beautiful those fountains… miss them! 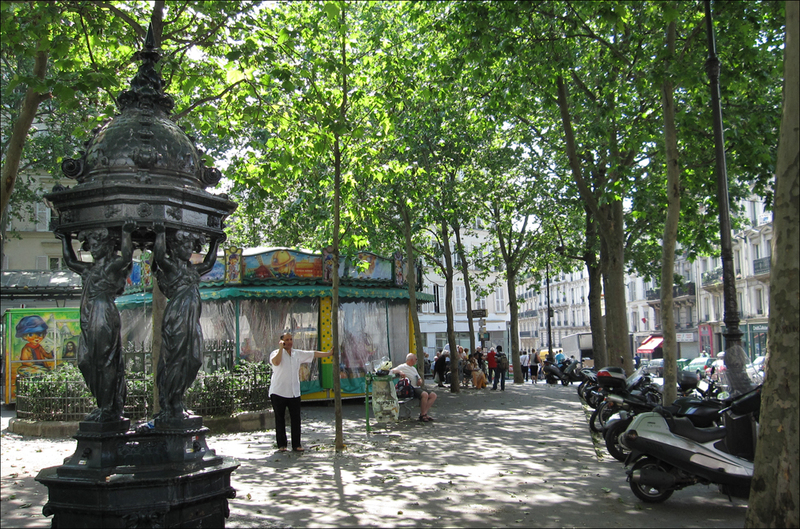 The Sunday morning shot at Place des Abbesses is wonderful. So evocative of your beautiful city. And so peaceful without the lunacy of Sunday trading which we have here. Every time a new post goes up; I get teary eyed, how I miss Paris and Europe in general. Great pictures and what a wonderfully full sense of Pariasian life. So much wonderful info…and the photos, especially ‘Sunday Morning’ give such a great sense of being there! I love that last picture too with the dappled shade. Can’t wait to go back there with new eyes now that you’ve pointed out all these wonderful things. There’s a Wallace Fountain in the “place” in front of my apartment; I love these! Please check out my parisbycellphone.com blog today as I’ll be posting a photo of a statue in the Louvre that bears a striking resemblance to the caryatids and I wonder which design came first! Off now to spend more time with Germain Pilon and Charles-Auguste Lebourg. Great food for thought! Frédéric Auguste Bartholdi spent a great deal of time at the Louvre. Thanks for adding a little mystery! You’re making me want to fast forward to summer with these post and pictures, Theadora. It is terribly cold and wet here in Holland at the moment that I even have to dig out my winter coat again. Bronzed statues, bronzed players, bronze wells . . . makes me want to head to a bronzage studio next time I’m in Paris! The fountains are refreshing–as are your images of them . . .
Love the last photo especially. I would be in heaven! Water’s free coming in but costs something coming out. 🙂 Having just made a two-day road trip, I too appreciate water greatly!! “Free Powder Rooms in Paris” has a definite (free) ring to it. I’d say “Go for it”, but that might not sound quite right. 🙂 The luxury WCs, though, sound like they’d be worth the investment. Oh, la, la, indeed!